J Street pushes Congress to pressure Obama to take a military strike in Iran off the table. Malcolm Hoenlein: that's irresponsible. The Conference of Presidents of Major American Jewish Organizations 2012 Annual Leadership Mission is currently being held in Jerusalem, and Arutz Sheva was there on Monday. 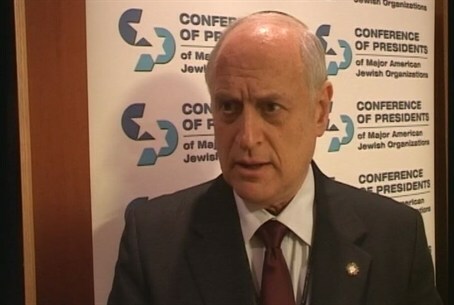 Malcolm Hoenlein, the executive vice chairman of the Conference of Presidents of Major American Jewish Organizations, addressed in a conversation with Arutz Sheva the report that the pro-Arab, anti-Israel J Street is pushing Congress to take the option of a military strike against Iran off the table. According to the report, which first appeared in the Israeli newspaper Makor Rishon, J Street has been calling on its members to contact their local representative in Congress and have them sign an initiative by two Congress members, which calls on President Barack Obama to stick with sanctions and diplomatic pressure on the Islamic Republic and not even consider the military option. He added that it is “irresponsible to invoke this position,” particularly in light of the overwhelming support by the American people and the Administration who understand how dangerous it would be to have Iran, a supporter of terrorism and terrorist groups, have nuclear weapons. “The vote in the Senate of 100 to 0 I think is the clearest statement of the understanding of the American people and our elected representatives and it shows that those who would come with a position like this are really out of step,” said Hoenlein. He said that Iran is the major issue which has been coming up in the annual leadership mission and added that Iran, which has threatened not only Israel but Jewish targets around the world, is a primary concern and will likely continue to be so. Hoenlein said that Iranian President Mahmoud Ahmadinejad and other terror leaders who see the position that the military option should be taken off the table, will see it as a weakness and exploit it. “When they hear that we’re taking a military option off the table, when they hear that there’s not the resolve to execute the sanctions fully, they believe that it’s a green light for them to move ahead,” he said.